Evaluations and assessments are both crucial parts of schooling. They are a way for a student to know about his academic strengths and weaknesses, and for the teacher to learn about the aspects of a child’s learning that needs to be focused on. 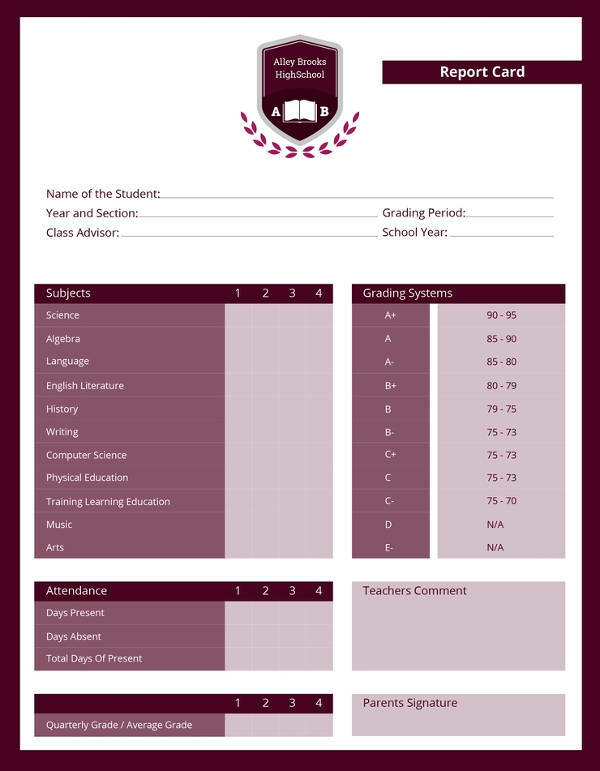 It is a curriculum-mandated requirement to have a list of courses with their corresponding percentages based on the credits earned by the student computed and shown to the student and his parents. You may also see examples of name card design. Report cards say a lot about how a student does in school. Does he participate in class? Is he punctual? Is he involved in extracurricular activities? Schools even grade values and manners in school and this will be reflected on the report card as well. If the child is misbehaving in any way, the parents will know through the report card. 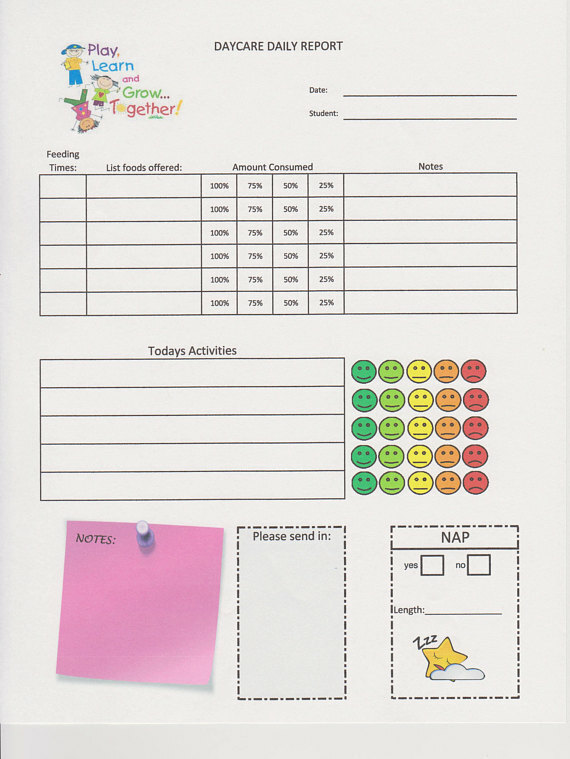 These can even show a student’s study habits based on the scores he get on examinations. You may also see greeting card designs & examples. 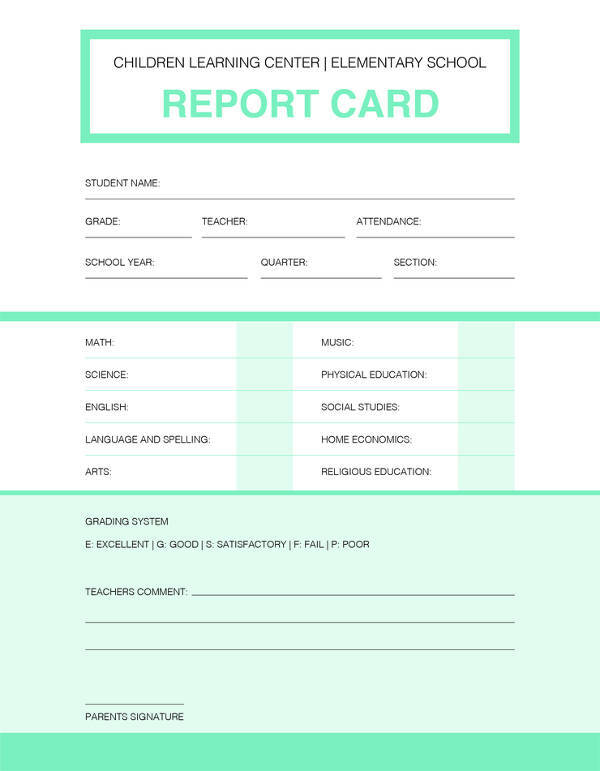 Report cards are basically formalized testimonies of how students perform in school. They are a summary of his academic achievements within a semester. However, along with these written accounts, a parent-teacher interview is sometimes necessary to truly discuss the performance and needs of the child. You may also like thank-you card examples. It can also help the parent understand the facets of their child’s education that they can do more to develop, and the teacher can have a better grasp of the child’s situation at home that may be distressing the child enough to affect his accomplishments in school. Why Are Report Cards Important? 1. Report cards can inform parents of how their child is performing at school. 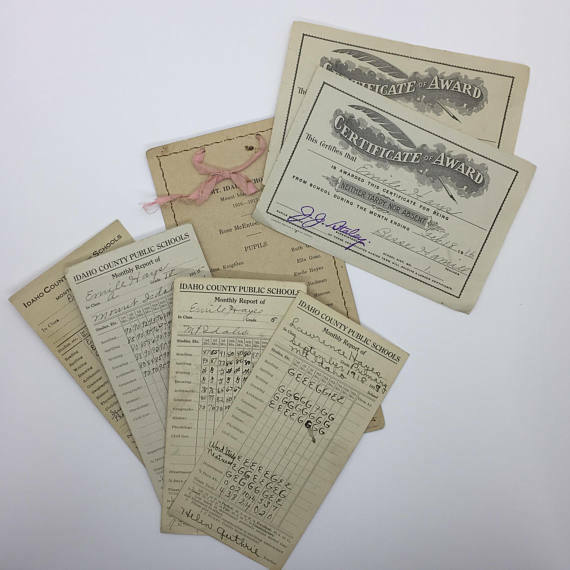 Schools often distribute report cards to students with the instruction that it should be returned, say the following week, with signature from their parents. 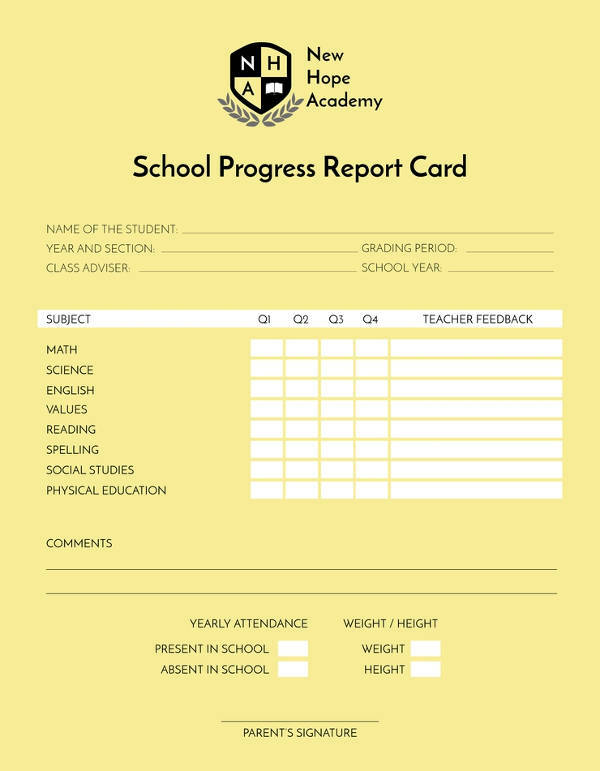 This way, the students will have no choice but to show their parents their report cards which will notify them on how good or how bad their child is doing in his classes. If the kid is doing bad, then they could perhaps enforce a study time at home. You may also see best greeting card designs & examples. (“No TV before homework” is a classic!) Or hire a tutor for the student to help him study for the subjects he is failing. And if the child is doing well, at least the parents can express how proud they are of him. This is one of the most effective encouragement ever. Sometimes, all students need are for their parents to tell them that they can see that they are trying and this can already make them want to do better. You may also like birthday card designs & examples. 2. Report cards show students the product of their efforts. 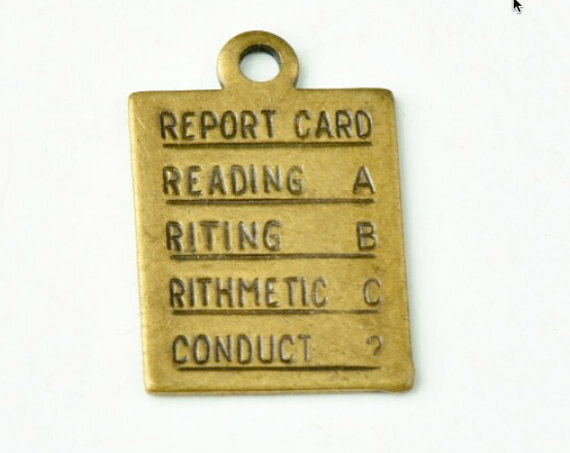 Whether or not the students did well in class will be reflected in the report card. It can help them see that doing good has positive results (in the form of straight A’s), and that not doing well has consequences, as well. It will show them that they are responsible for their actions and whatever grades they get for the semester are all products of their efforts, or the lack of it. You may also check out examples of musical greeting card designs. 3. Report cards have comment sections. Aside from the letter grades that the teachers give to the students depending on their performance, these comment sections will give space for the teacher to express his opinions on the student’s overall academic performance in all areas. Aside from the subjects, the parents would still want to know about their child’s behavior at school, even those that are not related to their child’s subjects, like the way they treat other kids and their teachers. You might be interested in what to write in a thank-you card. 4. Report cards are great motivators. There are very few things that could make someone feel better than seeing heir hard work pay off in the form of an A. There are also very few things worse than seeing ugly, squiggly F’s on your report card. Either way, whatever the results of a report card is, it’s going to motivate the student to work harder. If a student receives a high grade, it can motivate him to work even harder especially now that he knows what success tastes like. You may also see examples of business card design. On the other hand, if he has received a low mark, he will want to work harder so as not to have the same result again. People often put too much importance on report cards. Yes, the numbers on them matter but, contrary to popular belief, report cards can’t thoroughly reflect a person’s intellectual abilities. This is one of the disadvantages of report cards. People interpret F as dumb and A as smart when, in fact, a person’s brainpower is neither. You may also see examples of student business cards. As varied as school activities and subjects are, they do not exactly hold a perfect avenue for learning that can cater to the different learning needs of every individual. They can only reflect the abilities of a child based on his performance inside the classroom, and not all the other things he can do outside of an academic setting. You may also like business card logo design examples. A student may not be good in physics but he can be good with arts and crafts. A student may not be much of a public speaker or an essayist but he’s better than anyone at creative writing. Oftentimes, report cards do not reflect some areas where a student can excel, and with constant C’s or F’s in his report card, he may start feeling bad about himself. This can lead a child into thinking that he is more stupid than all the other kids in his class when he is just as good as everyone, maybe even better, but in aspects that the grading system does not include in its calculations. You may also check out vacation greeting card examples. Also, report cards may not indicate more complex difficulties in learning. Some children may have undiagnosed learning disabilities that thwart them from being effective students. This may only be reported by the teacher in the report card as an F, when, really, the student needs professional attention. You might be interested in rack card designs & examples. Basically, this means that the person have difficulties in interpreting the sounds that they hear, even those that are, to other people, are loud and clear enough. This learning disability, on the other hand, refers to the difficulty in understanding numbers and mathematical symbols. Even telling the time becomes a burden to people with this LD. 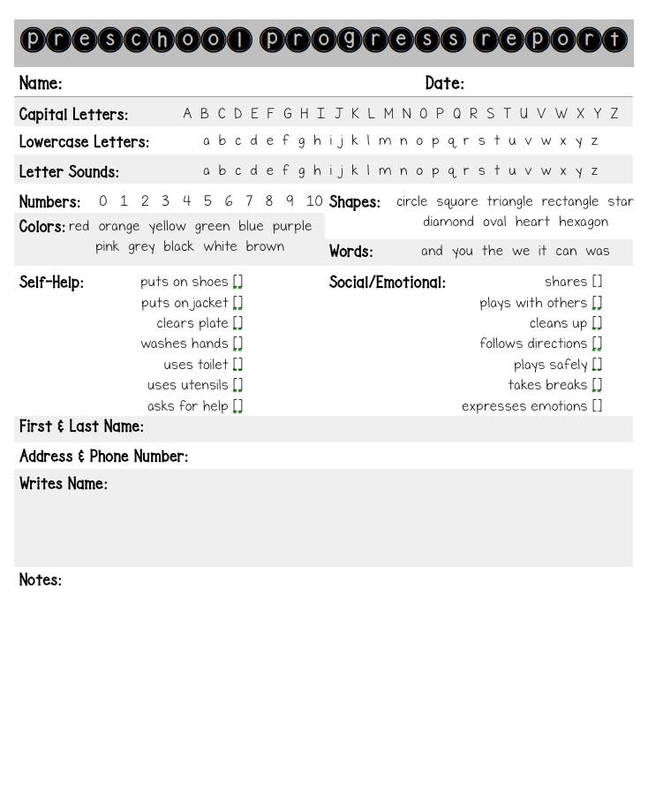 You may also see comment card idea designs and examples. Refers to the inability to write and think at the same time. The affected persona also has difficulty in spacing, writing legibly, and even spelling. This is usually characterized by an inability to interpret facial expressions. The affected person may also have motor coordination problems. This disorder affects the way a person perceives things. The person may have difficulty in copying or drawing what they see. This is also a characteristic seen in people with Dysgraphia. It is often characterized in subtle differences in they figures they make, or even in eye/hand coordination. You may also like luxury business card examples in psd. There are more than a handful of existing learning difficulties. These, if undiagnosed and untreated may lead to severe academic problems for the child. However, as unreliable as report cards can be in some areas, they are our most reliable summary for our children’s academic performance. You may also check out farewell card designs and examples. Well-developed. Demonstrating above the expected. Developing as expected. Developing the proper skills as expected in the student’s area. Beginning to develop. The student shows interest in learning and participating and, with time, will reach the expected level of performance. You may also see card designs and examples. Not yet apparent. The student still does not show any interest in learning but this does not necessarily mean that the child is failing. Only that he is using his own pace with his development. CD – Consistently Demonstrating. The student is showing evidences of learning and applying what he learned on a regular basis. DV – Developing. This means that the child is sill on his way to learning and applying his knowledge, and that, with steady steps, he is on his way to improvement. You may also like membership card designs and examples. NI – Needs Improvement. The student may be having difficulty in learning and applying his knowledge. He also needs practice in understanding the concept. Excellent. This tells you that your child have already mastered his subject, and still expresses desire to learn more. You may also check out corporate greeting card examples. Proficient. The student has a good understanding of the subject topics. Capable. A capable student has an adequate or sufficient understanding of things. Developing. This means that the student concerned is well on his way into understanding the subject matter. It is best to be guided in understanding the grading system that the school your child goes to follows to have a better grasp of what his academic performance is, where his strengths lie, and what his weaknesses are. You might be interested in credit card designs and examples. At the end of the day, report cards are only an attempt at summarizing your child’s performance at school. It doesn’t, in any way, define what your child can and cannot do. Learning is often subjective. There are a lot of possible factors that may be keeping your child from doing the best he can. Make sure you don’t start defining your son based on the number of A’s he gets. You may also see holiday card designs & examples.